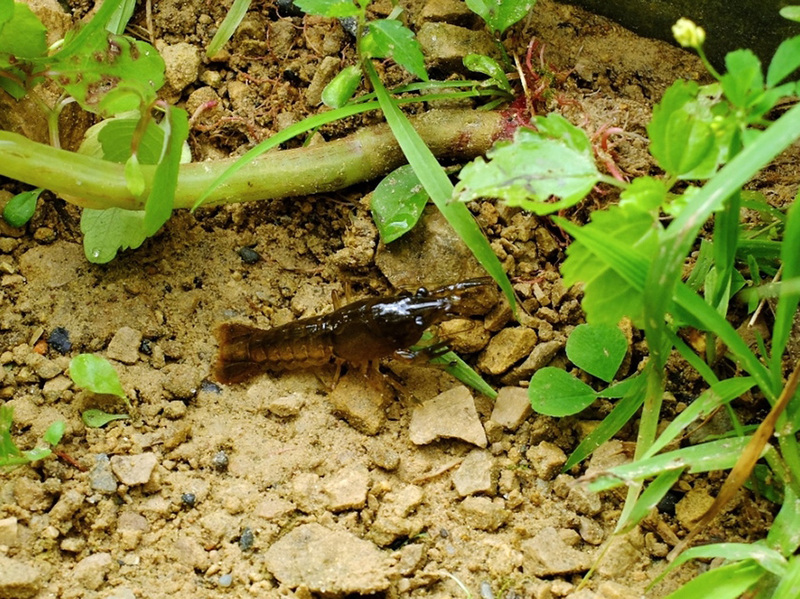 This is a medium- to large-sized freshwater crustacean. It is widespread and abundant across North America. It is native to central United States and Canada from Quebec to Tennessee in the east to Alberta and Colorado in the west. It is introduced and considered invasive outside of its native range from coast to coast. Adults are 1¾″ to 5″ long and smooth. Males are usually larger than females. Occasionally, an individual will be entirely bluish. The abdomen and the shield (carapace) covering the front part of the body (cephalothorax) are olive-brown dappled with dark brown. The long spike-like extension of the carapace that projects forward between the eyes (rostrum) has straight, more or less parallel sides. There is a pair of dark brown splotches on the upper (dorsal) side of abdominal segments 1 through 5. The claws (chelae) are broadly flattened and usually bluish with numerous yellow bumps (tubercles). They do not have black bands at the tip. The movable finger (dactylus) on the claw has a straight margin. 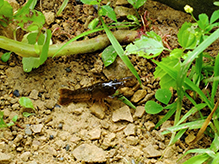 The legs are usually bluish with yellow tubercles. Mostly dead animals, but also living snails, insects, fish, tadpoles, and plant material. Breeding takes place in the fall or early spring. The female stores the sperm, sometimes for months, and fertilizes the eggs in the spring. The fertilized eggs are attached is raspberry-like bunches to the abdominal appendages (swimmerets). They hatch in one to two months. They moult several times and reach maturity in their second year. They prefer streams with rocky bottoms, moderate flow and turbidity, abundant cover, and stable water levels. They often use rocks, logs, or other organic debris as cover. They occasionally dig burrows into muddy banks, especially when water levels are low. To survive the winter, they migrate to deeper water that does not completely freeze and they become inactive. The hard, upper (dorsal), shell-like covering (exoskeleton) of the body or at least the thorax of many arthropods and of turtles and tortoises. In crustaceans, it covers the cephalothorax. The front part of the body of various arthropods, composed of the head region and the thoracic area fused together. Eyes, legs, and antennae are attached to this part. Several were crawling around a culvert that had water flowing into Wood Pond. They were about 1½ inches long. 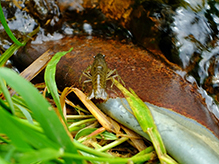 Northern Crawfish (Orconectes virilis) seems eager to migrate upstream, against the strong lotic current, during a high water event after three days of almost ceaseless precipitation. Photographed at the Turtle River State Park, North Dakota (22 May 2013). Crayfish - (virile crayfish I think) Who wants to get pinched? 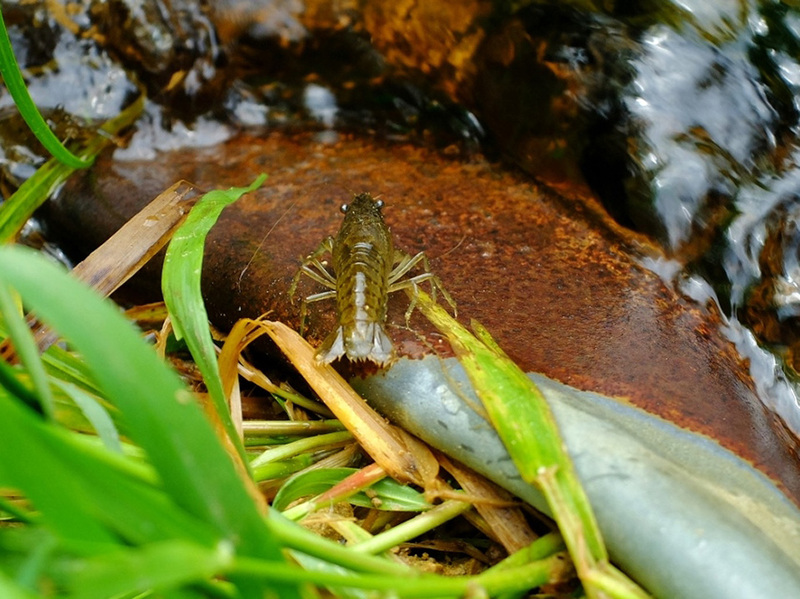 In this video, My friend Joe is learning to catch crayfish. It was pretty funny to be there. There is some cool crayfish facts and underwater footage.